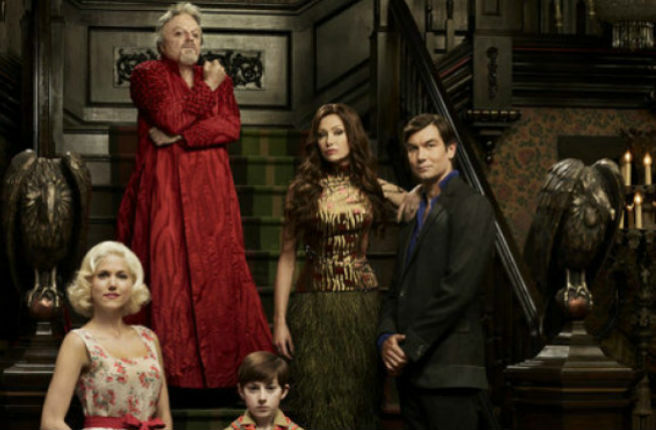 Last night NBC showed the modern day, darker and serious MUNSTERS pilot MOCKINGBIRD LANE. 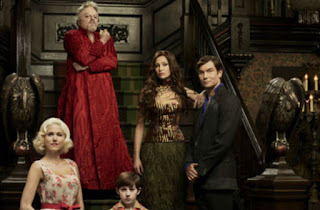 The cast featured Jerry O’ Connell as Herman, Portia de Rossi as Lily, Eddie Izzard as Grandpa, Mason Cook as Eddie, and Charity Wakefield as Marilyn. The pilot was written by Bryan Fuller and directed by Bryan Singer. The Munsters are moving to a new town due to Eddie’s camping trip with his scout troop turned into a nightmare. They find a new home at 1313 Mockingbird Lane, a house due to be torn down because of the horrible things that have happened there. The family argues on whether or not to tell Eddie he’s more like his parents and less like Marilyn. Grandpa decides he wants to “drink” again and Herman discovers he needs a new heart. Eddie is eventually told that he is a werewolf, but loses his new troop scoutmaster in the process. When I first heard about this reimagining of a classic TV show, I was dubious. The cast is impressive as so the men behind the project, but I still thought this wasn’t a good idea. NBC thought so to and decided not to pick up the series, but show the pilot as a Halloween “special.” I wished it had been picked up now, because what I saw was interesting. I’m not saying it would have gone more than a year, but there was enough for me to tune in at least one more week. Sure the tone is darker, but it still had some humor and there was some love there. Just not to the levels of the classic show – this was intentional. My only complaints: not enough Portia de Rossi and too much CGI. Both can be explained away with one answer – it was a pilot. If it was meant to be a one-shot, Lily would have been in there more at the cost of lines to other characters…probably Marilyn. The CGI was used for the “wow” or “cool” factor, more than likely it would have been toned down with other episodes. Overall the episode is well written and acted. In hindsight, the project should have been a mini-series. If proven popular, a regular series would have been ordered. We’ll never know now, and it’s a shame.